So now we enter the final few stages of Page 2's 2010 World Cup of Beer. After taking a week to review each of the groups (Group A, Group B + C, Group D + E, Group F, Group G + H) and setting up a 16-beer knockout stage, we are ready to run our contest down to a single, standout beer. 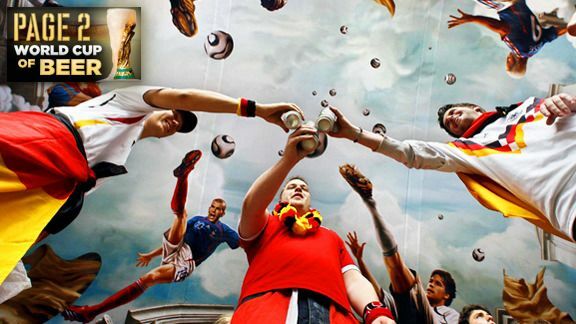 Who will raise the sacred cup in Page 2's 2010 World Cup of Beer? Find out below. Remember to toast (or roast) our final picks in the comment section. Notes: It wasn't too long ago when the U.S. faced its neighbor to the north in an Olympic gold-medal hockey game and President Obama bet a case of golden lager from a certain brewery. This time the U.S. proves its mettle by defeating its North American neighbor to the south. Notes: (As we mentioned earlier, Portugal's star player Cristiano Ronaldo is reportedly kicking it with Kim Kardashian.) We can't help but wonder which is more well-rounded , the reportedly rounder World Cup ball, Kim's renowned rounded booty, or the well-rounded taste of a Super Bock? Either way, Heineken has left us feeling flat. Notes: Boddingtons gets off to a great start, but oh no ... Green drops it again? (In this case a Boddingtons bottle.) Talk about a bitter defeat. Notes: As much as we love the taste of Kunstmann and enjoy hearing uplifting stories of survival surrounding the Chilean earthquake, Moretti moves on (and let's face it, Italy has had to move on from its own share of earthquake tragedies as well). The skinny: Kim Kardashian pledges allegiance to whom? Notes: Who knows whom Kim will ultimately choose? That being said, we have already made our choice. Notes: The Italians are know for their stout D, while Nigerians are know for their stout G(uinness). But the 7.5 percent ABV from Nigeria is just too strong and overpowers the Azzurri. Notes: Moretti pulls out the big guns and scores major points by coming up with this. (How about sporting that football at the beach this summer?) Super Bock talks a big game, but in the end its chant was developed by outsiders, not to mention it doesn't even rhyme. THIRD PLACE: ITALY (Moretti), and PORTUGAL (Super Bock) has to settle for fourth, like in the 2006 World Cup. Shane Igoe is a sports and entertainment writer based in Los Angeles. He can be reached via his Twitter page.